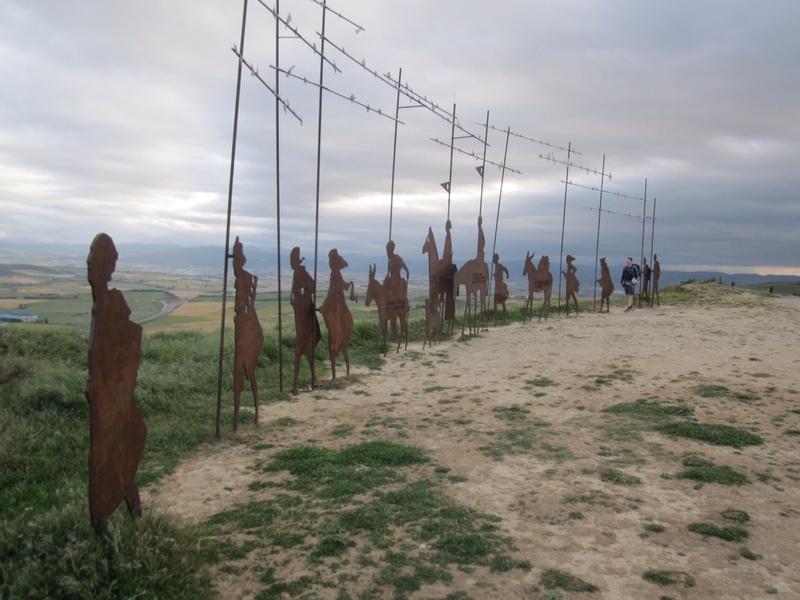 As we’ve been making our way across the meseta, we’ve had some terrific experiences, including two of my favorite days on the Camino. I’m working on a few more substantive blogs, but in the mean time, here’s a cool video Anne-Claire shot of a shepherd moving his flock through Castrojeriz. We came around a corner to find him waiting for a clear lane through the sporadic traffic with a hundred or so sheep. Every so often, he’d whistle and throw a tiny rock, and the dogs would wheel the flock to the left or to the right. In the midst of the pandemonium every time the sheep moved is a donkey who’s sort of a center of calm in the herd. I used to work for a guy who said you need only watch the way the blindly follow each other and you can see why religious texts compare us humans to sheep so frequently. I don’t think it’s a compliment. On Saturday, Anne-Claire and I left the relative buzz of Burgos, a city of 170,000 people through a park on the edge of the city. Compared to the grimy eastern entrance to the city – an industrial zone we’d walked through the morning before – the morning quiet of the river promenade transitioning to the wheat and grass fields of the meseta was sublime. Much of the way was flat, and we had a clear goal in mind – to reach the tiny town of Hontanas more than 30 km away, a village Anne-Claire and I had visited with Amable and Michel last summer. 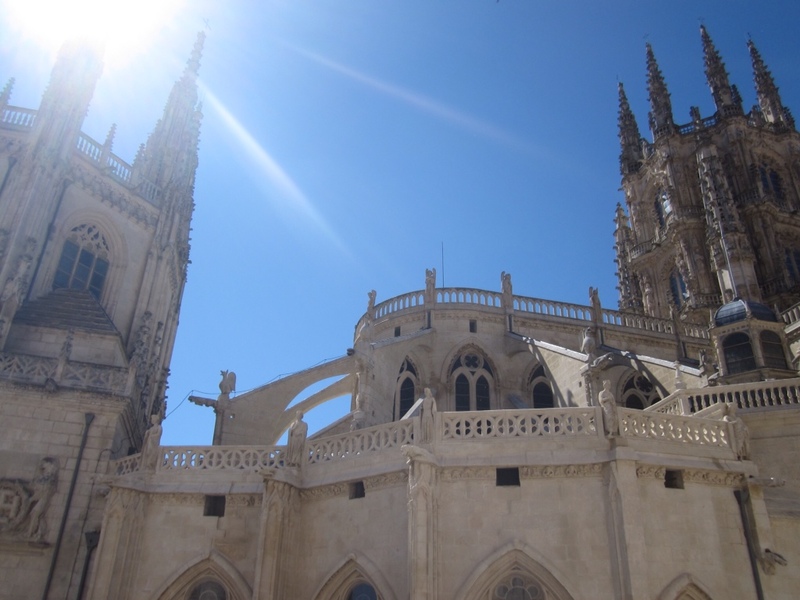 The Burgos cathedral is a true hidden gem in Europe, palacial in scale and ostentatiously ornate beyond all expectations. Outwardly Neogothic, its interior blends its Gothic roots back to the 12th century and the heavy influence of the in-vogue French churchs of the time with Baroque and Rococo ornmantation. While impressive, it does seem that any bishop or patron with enough money could arrange to have a chapel (most of which would be massive churches on their own stateside) built in their honor. A South African friend of ours commented that the term “stinking rich” came from this practice, as selpulchres of old weren’t air tight and the fumes from decomposing bodies would escape into the church. Beyond the grasp of the city are just wide open fields and big blue skies so vivid they don’t feel real. Every so often, a fallow field blanketed in poppies in full bloom. Though we arrived exhausted from a day of sun and wind exposure, the hike to Hontanas was one of my best days on the Camino. As we walk the Camino, we’ve been lucky to have constant breezes. Though its sometimes a bit chilly, it’s been a welcome respite from the heat as we’ve begun to cross central Spain over the past few days. It’s also a source of energy, and wind farms are everywhere here in Spain. To hear Amable and Michel talk about it, to the residents of Castrillo de Murcia (and probably just about every other tiny hill town in Spain), the construction of these “ecological parks” was contentious, as some folks didn’t want their view obstructed. I can sympathize, I suppose, but there’s also a certain beauty to the massive spinning blades, especially when it might mean even a step toward our independence from fossil fuels. Here’s a quick look at a wind farm that we passed on our fourth day, about 10 kilometers from Pamplona. My apologies for this post being a bit scattered. I’ve been thinking about what to write for hours while walking – perhaps a bit too much. Hopefully, something coherent comes out of this. From our first day on the Camino, I’ve been impressed with the level of faith that sustains some of our fellow pilgrims through what for many of them is the toughest endeavor they’ll ever undertake. My worries about the annoying pain in my foot pale in comparison to the blisters and tendonitis and arthritis and extra pounds that plague other hikers, who come in every shape, size and (starting from a minimum of around 20 years old) age. 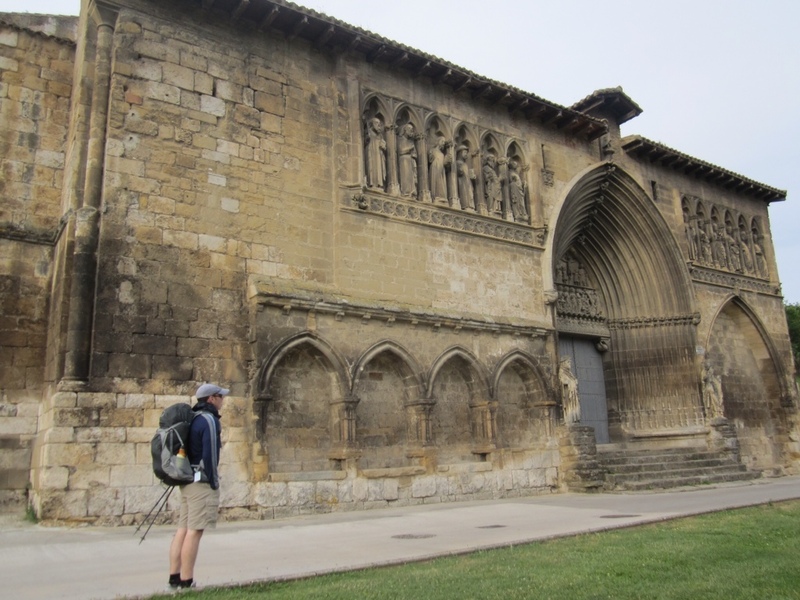 While people seem to walk the Camino for all sorts of reasons, we’ve noticed that most folks are older, and typically the reasons these pilgrims are walking at least tangentially religious. Even more broadly, I don’t think I anticipated how much weight many Spaniards, especially older ones, give to the Camino. Whether they’ve done it themselves or they’ve just seen it grow from the tiny trickle it must have been during their childhood in the early 20th century, their respect transcends language. In Pamplona, a woman shook her fist at us from a hunched position over a set of braced crutches. Until this point, we’d gotten only chilly receptions from locals, so I expected more of the same – not the wishes of “Buen Camino!” and “Via con Dios!” that she yelled as we passed. Occasionally, we’ll walk into a restaurant, and thanks to my light hair, blue eyes, or, more likely, the slightly hobbled walk of an all-day hiker, we’re spotted as pilgrims and toasted or wish a safe journey. Or people who help us along the way take a second out of their workdays to make things just a little bit better, like the woman at the post office in Burgos who mercifully spoke more English than we spoke Spanish, spent 45 minutes with us as we sent extra clothing ahead, and gave us a fistful of postcards to remember our trip by. And sometimes, we’ll step into one of the Tuesday evening mass for the pilgrim blessing. Incidentally, the song they sang for our protection in Santo Domingo de la Cazada sounded an awful lot like “This Land is Your Land,” a tune that’s stuck with us for hours of hiking over the past few days. The other day in a beautiful town called Estella, a woman stopped us in front of the ruins of an ornate 12th century church. She asked us if we were pilgrims, and when we said yes, she launched into (so far as we could tell as she was speaking in Spanish) the story of the church and how most pilgrims only stop to take a photograph and move on. When she realized we weren’t understanding much, she smiled and dropped her gaze from ours, then put her hand on my shoulder and wishing us well for our journey. 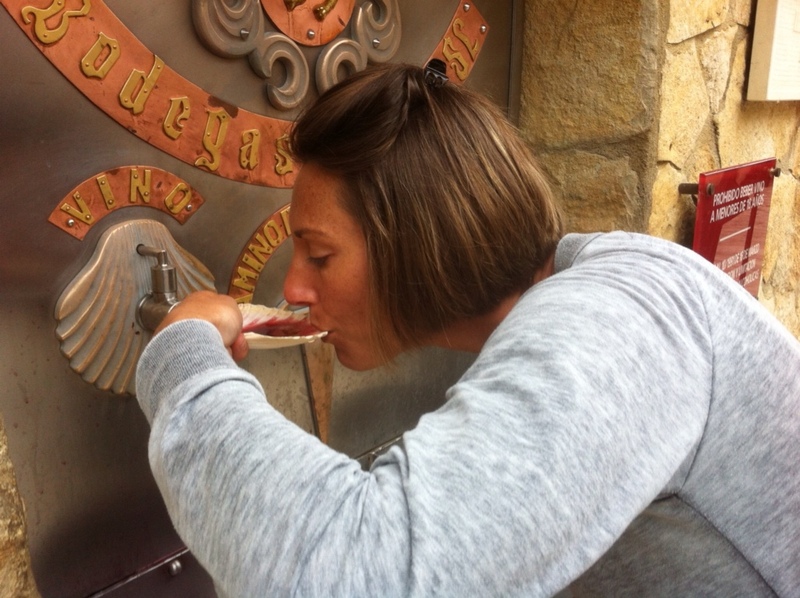 As we left Estella, we were greeted by a pleasant surprise – a wine fountain provided by a few resident monks. Of course, it’s important to realize this respect is for this path we’ve chosen to walk and the month of reflection it entails. I imagine also it’s a reflection of the place her faith has in the lives of those we meet along the way. 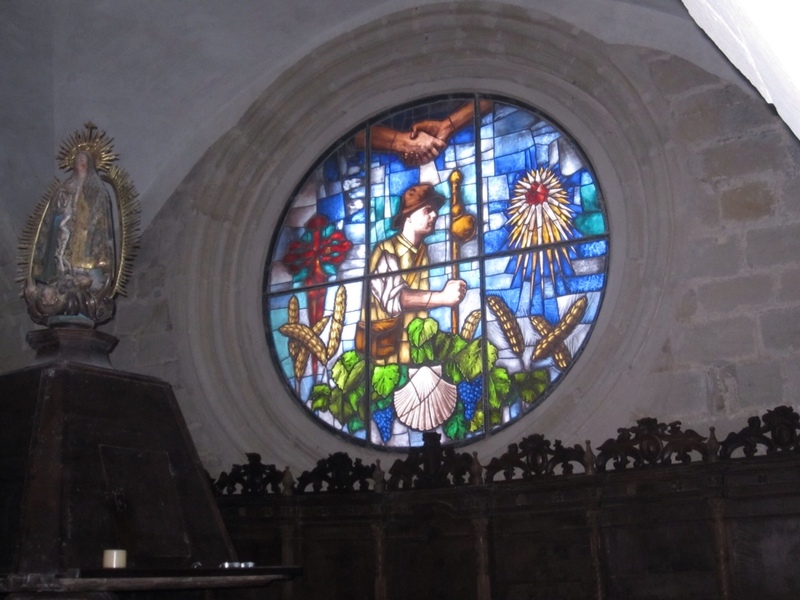 In many ways, my experience on the Camino has opened my eyes to the best of what religion can be. Community, discipline, thoughtful reflection – you find all of these benefits in some measure in most pilgrims you meet. And yet it’s difficult to reconcile the sort-of personal purity we get to experience in these momentary interactions with the broader doctrine that Catholicism, and most faiths in fact, espouse. Yes, belonging to a church provides the opportunity to build community with like-minded folks, who are often pretty nice people. It provides the impetus for hard work and discipline, out of which accomplishment and success are often born. And I find myself truly missing the ceremony, the rituals and the practice of faith on a weekly basis that I had growing up in a church-going family. But in someway, being part of a faith implies the tacit if not explicit acceptance of church dogma, doesn’t it? Throughout history right up through the present, that has translated into the exclusion/subjugation of certain groups based on gender, race, orientation, etc., the glorification of wars in the name of God for land or commodity or souls, and the exaltation of worldly materialism. And this from faiths whose very name comes from an inclusive pacifist who by all accounts was a communist (note the small ‘c’). But here along the Camino, we’ve met pilgrims of faith who demonstrate the good parts of religion – taking each other based only on our shared humanity, absent the shackles of unacceptance that can come with doctrine. These are perhaps incomplete exchanges, as we don’t know much about the people we meet in these momentary interactions. The institutions that we create as imperfect people aren’t in fact the perfect, unerring sages we hold them up to be. I remember a favorite priest growing up teasing my sister (but serious, in a way, as well) that she would be the first woman priest. This tiny act of dissent seemed to me to more closely follow all the teaching we seemed to be getting during mass. So too, many pilgrims I’ve met actually more closely follow the tenets of Christianity than the grand institutions, even the one (Catholicism) that has made this pilgrimage so important for more than a millennium. I suppose in some way it’s a good example of individual parts being greater than the whole. We left our pristine hostel attached to a stunning 12th century church in Roncesvalles. The signpost at the edge of town says Santiago de Compostela is 790 kilometers away, though by foot it should be a bit shorter. After crossing the Pyrenees the day before, we spent much of our second day ambling through pine forests and in and out of sleepy farm towns in the Basque countryside. 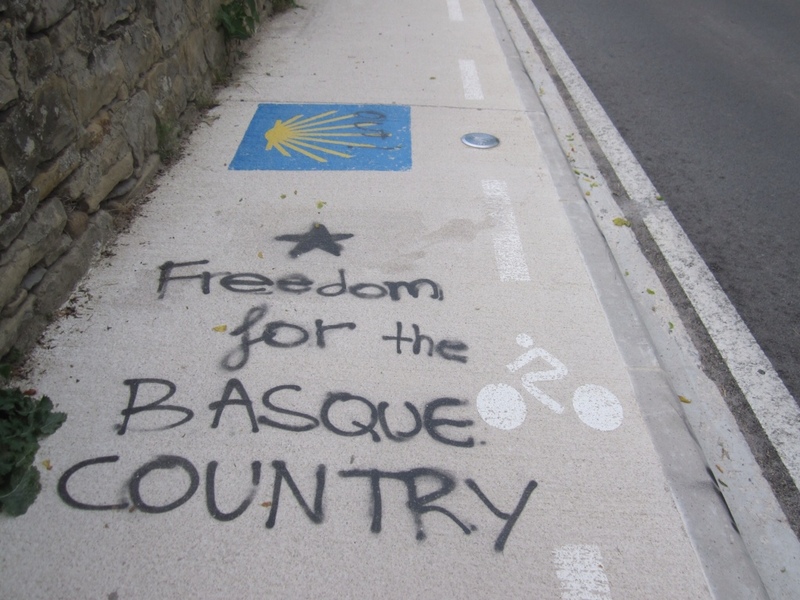 The island of Euskadi (Basque Country) straddling the mountains is fascinating, in part because it’s so tough to find out much about the people who live here. A language resembling neither French nor Spanish in any discernible way presents the first barrier. I get the impression that there’s a secrecy to the culture, a pride that depends little on what others outside think. But this is just a gut feeling, as I’ve done little primary research. Adding to the air of mystery is an undercurrent of witchcraft and mythology. I’ll try to look up the story about the statue to the right welcoming pilgrims into Roncesvalles. Aches and pains have started to pop up that either weren’t an issue or were masked by adrenalin and excitement. Still, it’s a privilege to watch the landscape change with each step. After lunch, we climbed through the rather ugly industrial town of Zubiri to one of the countless hillside villages paved in cobblestones with walls lined in rose bushes in full bloom. Often you can smell the villages before you see them. We spent the night in Larrasoana. Just a few days in, we’ve picked up on a bit of frustration with the pilgrims, which is understandable. In general, we’ve found most of us are pretty respectful, but mob mentality takes over a bit and we can be a selfish lot, descending in huge groups on tiny towns, demanding dinner and beds and then taking off the next day. So I’m a bit resigned to the idea that most of the people we meet will be fellow travelers not locals, with a few momentary exceptions here and there. Let’s start with the travelers. 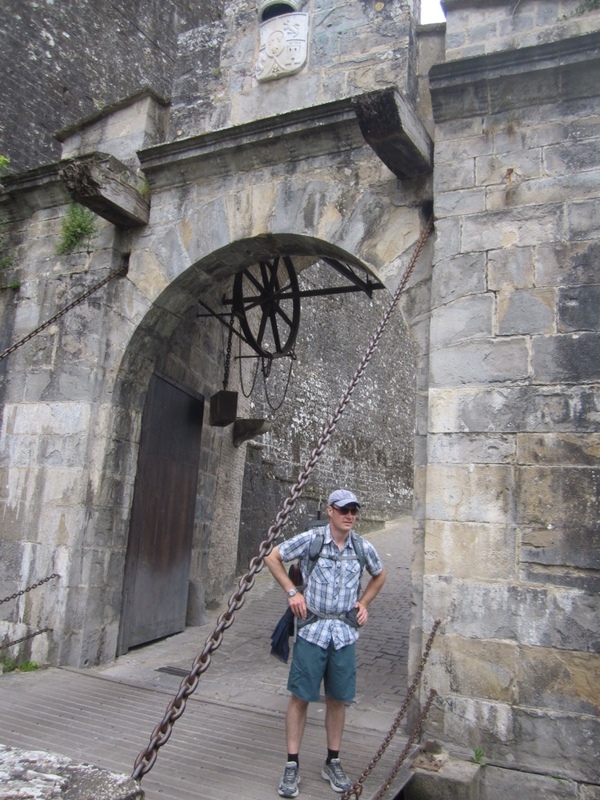 Speaking English makes walking the Camino easy (and traveling in general, I suppose). But Anne-Claire’s French has opened us up to a larger swath of pilgrims. We had the good fortune to sit next to Patrick from Paris and Claude from Quebec at dinner. Claude speaks English, so we had a nice mélange of that and French and enjoyed sharing a meal with them. 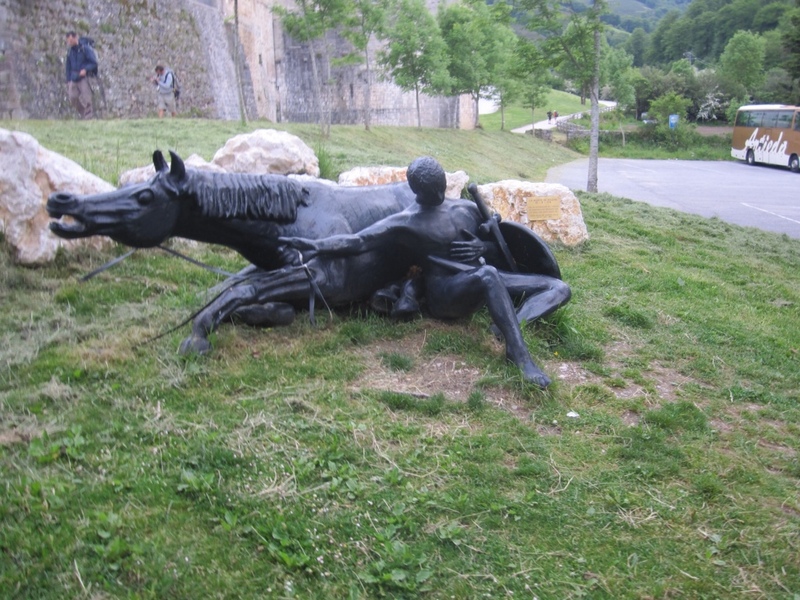 They both start from Le Puy in France about a month ago. They’d walked together their first three days, then had been separated until just a few days ago, when they ran into each other at a tiny stopover on the way over the Pyrenees called Orisson. They passed us on the trail the next morning when we’d stopped for breakfast. 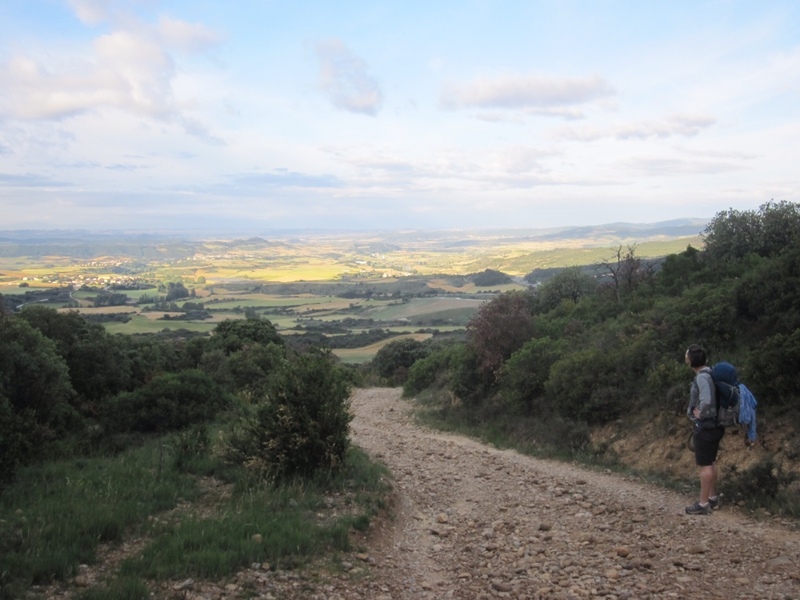 This is how the Camino goes, I’m told – you see people, make flickering connections and only providence will allow you to meet again. Much of the rest of the day was spent hiking up to, through and past Pamplona. After the countryside, the bustle of the town’s cars and people were a little overwhelming to us, so we didn’t linger too long, though once again, I was impressed at how beautiful Pamplona is – parks, monuments and a festive atmosphere beg for another visit. We stopped for lunch in a suburb 5 km outside of town, only to realize we had little cash and were headed to an even smaller town up in the hills for the night. Even what the guidebook calls an “affluent dormitory community of Pamplona” didn’t have an ATM, so Anne-Claire walked a few kilometers to remedy the problem. were none other than Patrick and Claude. 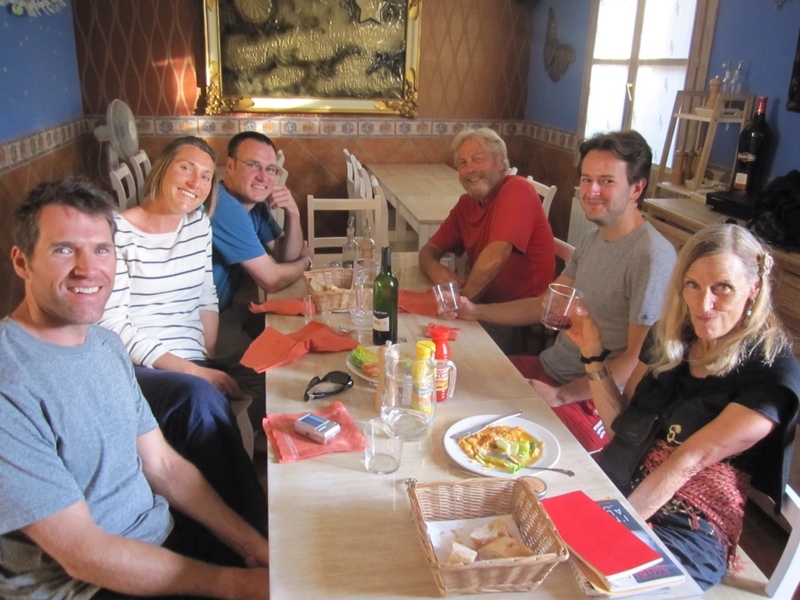 We laughed off the day’s toils and shared a bit about our families over beers and the ham and chorizo that Patrick always keeps in his pack, before embarking on a tedious dinner, thanks to a few late-arriving guests. I’m striving to keep snark and cynicism out of this blog, so if you want to hear the story, perhaps we can share a few beers (and some cured meats) in person.